This German Sturmgeschütz III Ausführung G Tank Destroyer with the long barrel 7,5-cm Stu.K. 40 L/48 main gun can be found at the Deutsches Panzermuseum in the small military town of Munster, Germany. German StuG III Ausf. G Sturmgeschütz Tank Destroyer Sd.Kfz.142. The square blocks bolted on top of the track guards are Jack base plates. The central black mushroom attachment is the headlight. At the start of World War II most of the German Army's artillery guns were still drawn by horse. They could not keep up with the speed of the tanks during a blitzkrieg offensive. Those that were towed by half track or lorry still took a long time to set up before they could fire on the enemy accurately. On the Eastern front, in Russia German Panzer crews were horrified to find that there 50 mm guns could not penetrate the frontal armour of the Russian T34/76 medium tank or the KV-1 heavy tank. Only the towed 75mm anti-tank gun could stop these new threats. A stop gap solution was found by putting anti-tank guns on top of tank chassis. They were cheap to build. Existing tanks could be modified quickly. They were a way of using up outdated and captured tank chassis. These early open topped tank destroyers were rushed to the Russian front, whilst the tank designers were trying to come up with a way of fitting larger guns into new tank designs. 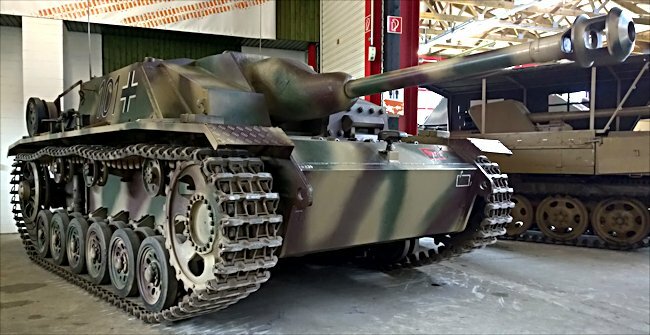 The StuG III Ausf. G had a very low profile which made it hard to see on the battlefield. The armour plate that enclosed these top mounted tank destroyer guns was thin and offered little protection for the crew. A better solution was required. Orders were dispatched for a prototype vehicle to be built that was completely armoured. The Sturmgeschütz III assault gun mounted a 75mm gun on a Panzer III tank chassis. It was a heavier gun they could normally be mounted on such a tank. This feat of engineering was done by dispensing with the turret. The gun was set on the fixed mount with limited traverse. The StuG III was a very effective vehicle on the battlefield. The German infantry fighting on the front lines welcomed the introduction of these assault guns into the battalions. Here was a weapon which could fight with the infantry at crucial points on the battlefield. It could move at their pace and take on the enemy strong points, including pillboxes, machine gun nests and troops dug in behind the solid walls of buildings. The StuG III crews never saw themselves as tank men. They wore different uniforms. They consider themselves to be part of the artillery , who happened to man mobile assault guns that gave support to the infantry. They were still gunners at heart. The crews began to love the new machines. Although conditions inside were cramped, at least they were protected from small arms fire and artillery shell splinters. The powerful 75mm gun meant that they packed a powerful punch. The StuG III had a crew of four: commander, driver, gunner, and loader. Officially this assault gun could only carry 54 rounds of ammunition, but crews soon worked out how to store additional shells to bring the total up to 90 by stacking extra rounds in layers on the floor of the vehicle. This meant that the crews of the StuG III assault guns could stay in action longer and maintain the support they were giving to the infantry. Initially Sturmgeschütz III assault gun were organised into independent battalions of three troops that originally had six StuG IIIs in each troop. The commander of each troop also had his own vehicle. In later years the number of vehicles in each troop was raised to ten and the battalions were renamed as brigades. In theory each brigade fielded 33 Sturmgeschütz III assault guns. In practice, these ideals were hardly ever achieved. Only highly favoured brigades received the full quota machines. These independent brigades were assigned to infantry battalions. As the war continued commanders of these Sturmgeschütz III assault gun gained a wealth of battle and tactical experience from near constant exposure to action on the Russian front. Officially the StuG III was to be deployed en-masse as a complete Brigade. Realistically, this hardly ever happened. Vehicles sometimes deployed as a troop level, in groups of three and more often than not, on their own. A number of early StuG III vehicles were lost because of the lack of a close protection machine gun. Russian infantry were able to get close and use Molotov cocktails, magnetic mines, handheld anti-tank weapons to knock them out. The crews had nothing to shoot back with. A shielded machine gun was fitted to the roof of all newly produced Sturmgeschütz III assault guns and retrofitted to existing machines. The early StuG III vehicles were fitted with the short barrelled low velocity 75mm StuK 37 L/24 cannon that mainly fired high explosive HE infantry support ammunition. During operation Barbarossa, the need for a better gun that was capable of penetrating the front armour of the new Russian T34/76 medium tank and KV-1 heavy tanks. This was when the Sturmgeschütz III assault gun was upgraded to the long barrelled high velocity 75mm StuK 40 L/48 gun. With this gun the StuG III was more than the match the new Russian tanks. It became more of a tank destroyer than just an infantry support weapon. It's low profile, made it hard to spot on the battlefield. It's sloping armour calls Russian shells to bounced off. The Sturmgeschütz III helped turn the tables on the Russians. This new gun was first fitted to the StuG III Ausf. F in 1942. The Germans now had an effective tank killing machine. 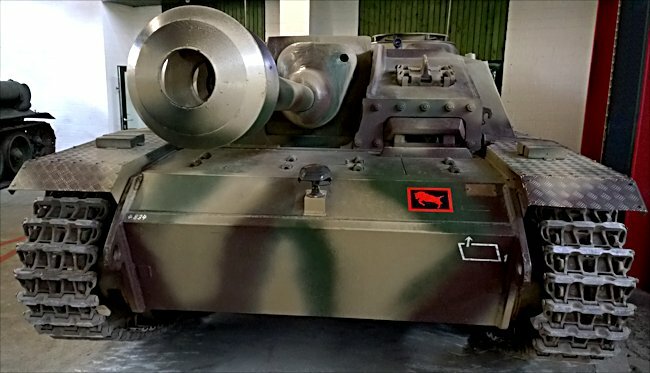 The long barrelled gun gave the shells fired by the StuG III a much higher velocity and armour penetrating capacity than the 50 mm guns fitted to the Panzer III German main battle tank. This tank was phased out as now been obsolete. The chassis is was still built and used for the production of these assault guns. Over 20,000 enemy kills were claimed by German assault gun crews during World War II. From experience the crews learnt to use defensive tactics against the Russian and Allied forces sent against it. They would find locations where they can hide and awaits the arrival of enemy tanks. While stationary, with great accuracy, they were destroy armoured vehicles that strayed within their killing ground. They within change position quickly so as not to be targeted by enemy artillery or direct fire. Over 11,500 Sturmgeschütz III assault guns were produced during World War II. The sheer numbers that were manufactured is an indicator on how effective and popular these machines were on the battlefield. By comparison only 5800 Panther tanks were built. 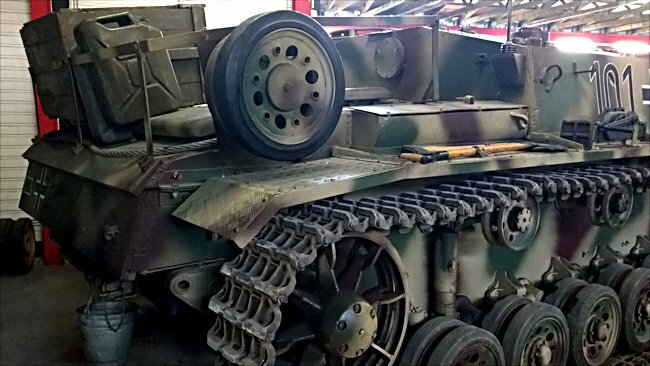 Extraordinary results were achieved by highly trained, experienced Stug III crews in Russia. It was not uncommon that three vehicles would account for over 10 Russian armoured vehicles being knocked out in a single action. The main defect with this vehicle was the limited amount of fuel it could carry as well as storage for ammunition. They had to keep on coming away from the front line to get resupplied leaving the infantry units at risk from being overwhelmed by the enemy. Orders were given that assault gun commanders had to inform infantry commanders that they were leaving only to refuel and rearm before leaving the front line, so as not to dishearten the German troops who may wrongly conclude that the StuG IIIs were retreating. It was standard operating procedure to try and rotate the vehicles going back to be resupplied. This was so the front line troops not suffer from lack of protection. The commanders had to try and organise that his vehicles would leave the field of battle relays. This was the stop infantry morale suddenly nose diving if they saw all their armoured support disappearing at same time.